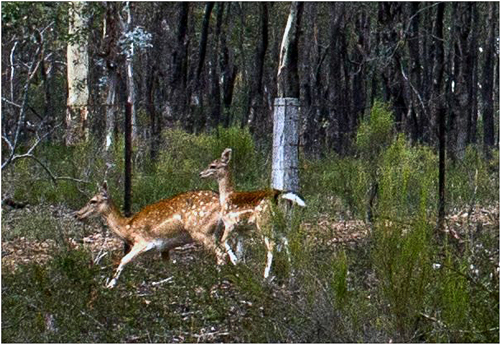 Readers of the Castlemaine Mail on Friday February 20 will have noticed Newstead policeman Grant Macdonald referring to the increase in wild deer crossings at Green Gully. This, of course, is a potentially serious traffic hazard. Feral deer have a peculiar status in Victoria : they’re definitely a nuisance, and environmentally damaging—but they’re classified under the wildlife act, and are therefore protected species…while at the same time being classified as Game, which means that under certain conditions they can be hunted. This contradiction has caused governments to tie themselves in knots trying to justify the promotion of hunting while piously intoning words like ‘sustainability’ and ‘environmental protection.’ This is the ‘Deer Mistake’ referred to in an assessment by the Invasive Species Council in 2008. Those interested in the subject are advised to have a look at this report. Deer are mainly a problem in Gippsland, where they can cause very serious damage to vegetation and waterways. Their effects in this region are not so clear. They are not at all uncommon in the Muckleford/Walmer area. As far as we know, there is no control or monitoring program in existence for the animal in the Box Ironbark regions.